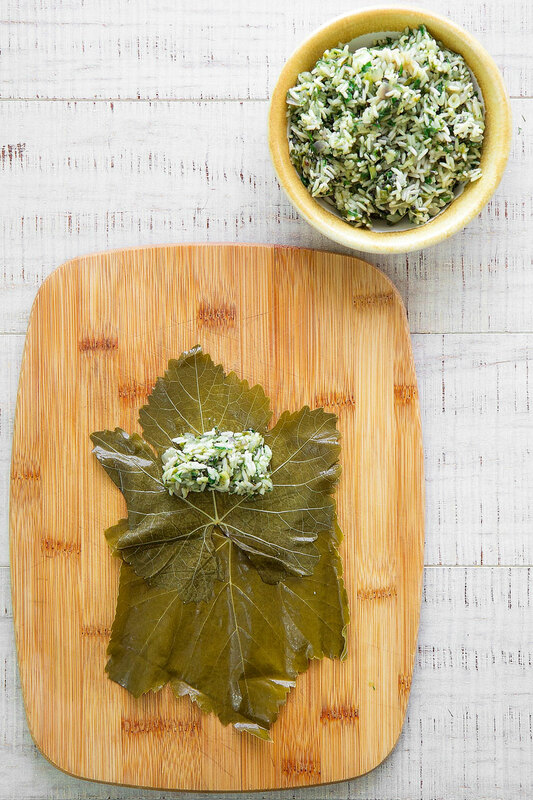 DOLMADES RECIPE: Greek stuffed grape leaves - all you need to know! 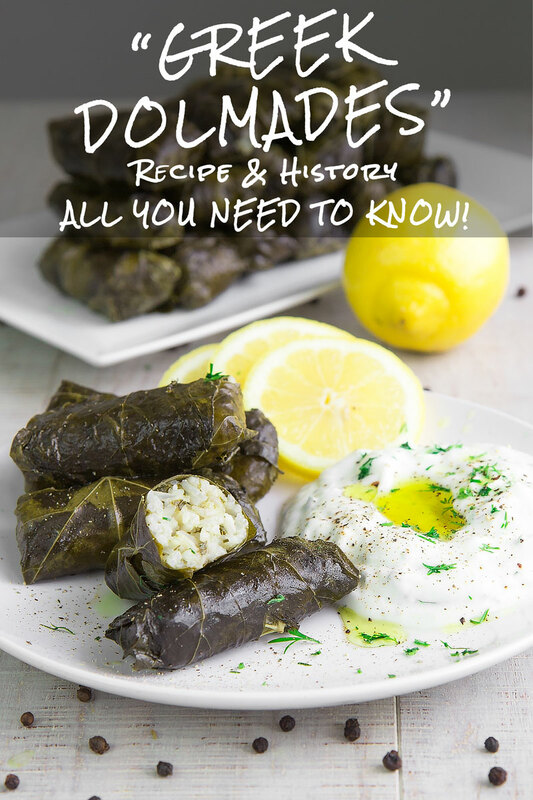 You are here: Home / Gluten Free / GREEK DOLMADES RECIPE: stuffed grape leaves – all you need to know! The origin of Dolmades (sing. Dolma) is ancient and unknown. Rolls made with grape leaves and stuffed with various ingredients are present into the cuisines of the Turkic, Balkans, and Middle Eastern areas. Likely, the term Dolma derives from the Turkish word Dolmak (that means “to fill”) and describe plenty of different recipes that have in common a vegetable leaf rolled and filled with different stuffing. 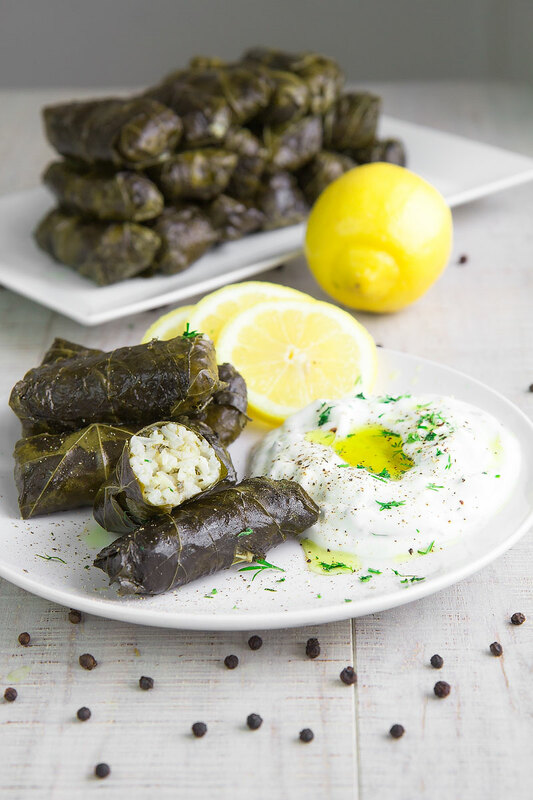 Dolmades are a symbol of conviviality and protagonist of the Meze (or Mezze): a traditional meal composed by dozen small plates traditional in Greece, Balkans, North Africa, and the Middle East. During the Meze, the tablemates share the dishes symbolizing generosity and sympathy for their fellows. The grape leaves need a particular process to become edible. The Leaves are rinsed thoroughly, then poached into boiling water a few minutes until tender enough to be easily rolled. After that, the leaves are immersed in a bath of iced water to preserve the color and stop the cooking. The grape leaves are then preserved into a brine composed by salt and water. Depending on the country these stuffed rolls have different names and ingredients. The Sephardic Jews call them Yaprakes Finos: grapeor morus leaves stuffed with rice, pine nuts, tomatoes, and onions. In Iran is traditional to prepare rolls called Dolma Bargh, grape leaves stuffed with rice, bulgur, peas, cilantro, and spices. In Armenia, the stuffed grape leaves are called Yalachi Sarma and filled with rice, parsley, tomatoes, and cinnamon. 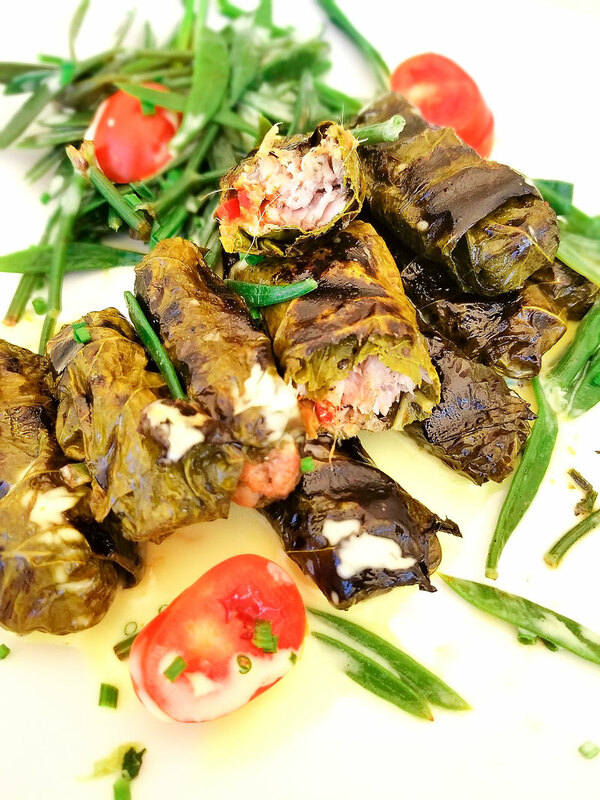 Likely, the Greek Dolmades are the most famous stuffed grape leaves (or rarely cabbage leaves). The classic stuffing of Greek Dolmades is traditionally vegan and composed of rice, onions and mixed herbs. On the other hand, traveling In Greece, I often tasted exquisite variations. For instance, in Thessaloniki, I recently ate Dolmades stuffed with grilled sardines: delicious! GRAPE LEAVES – to roll a standard size dolma you need of a large grape leaf. 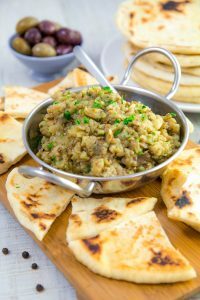 Often the canned grape leaves are smaller than needed, so consider to overlap partially two leaves rolling them together around the stuffing. FILLING – As I said, the typical dolmades filling is vegan. 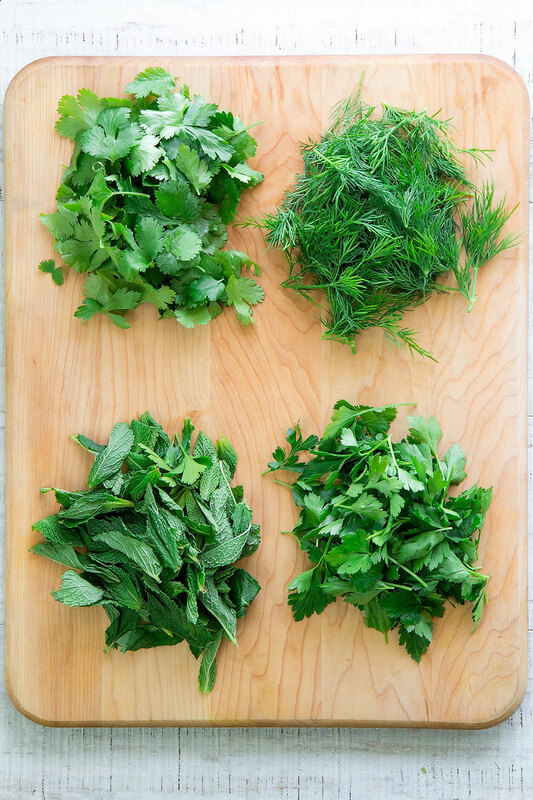 The choice of the herbs is critical; the most traditional are mint, dill, parsley, and coriander. I suggest you to use all of them to create a delicious mixture of flavors. SERVING – Serve dolmades warm or at room temperature, as an appetizer along with tzatziki or other sauces. STORING – Store the Dolmades into an air-tight box and place into the fridge up to 3 days. 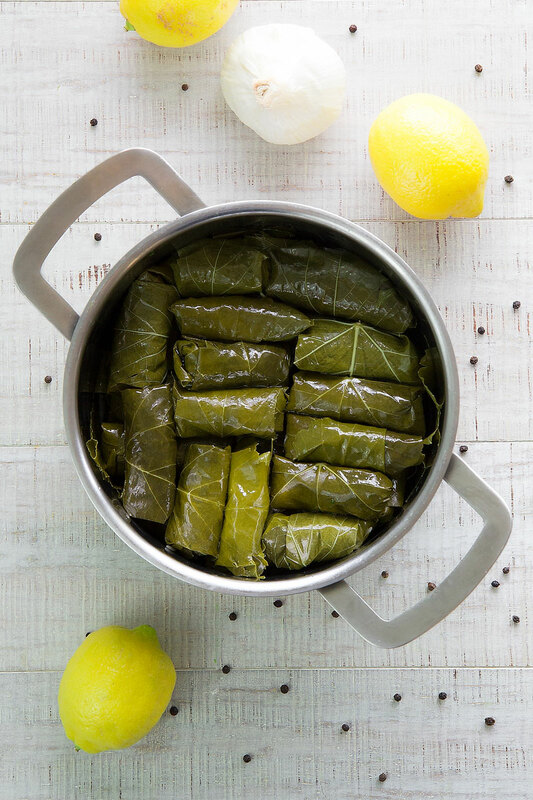 GREEK DOLMADES RECIPE: stuffed grape leaves - all you need to know! First, peel and mince the red onion and the garlic. 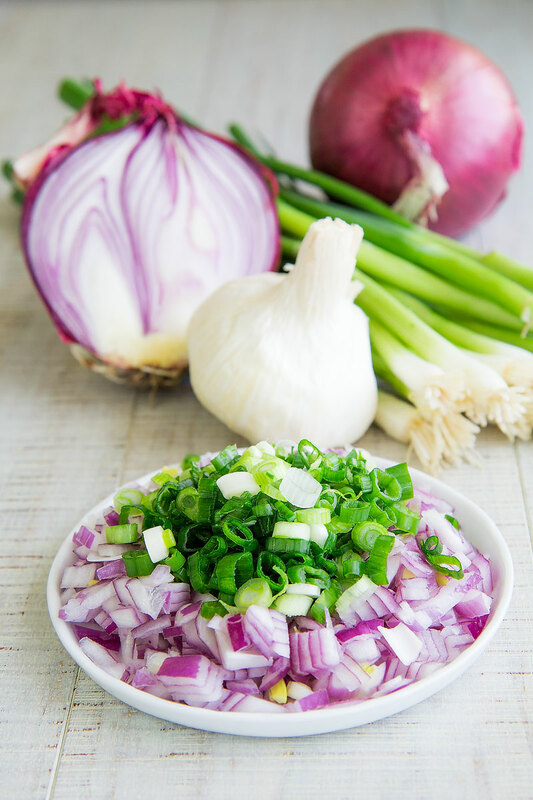 Then reduce the spring onions into thin rounds. At this point, pour the vegetables into a saucepan along with 3 tbsp of olive oil and sauté 20 minutes over medium heat until the onion becomes soft and translucent. Now, add the rice into the pan, and sauté a couple of minutes along with the onions. Then, add 1 cup of boiling water and simmer the rice half of the time suggested onto the box, stirring as needed. If the water evaporates too early, add a little more: at the end, you want the rice half cooked, and the water completely evaporated. Finally, add salt and pepper to taste, cover the pan with a lid and let it rest far from the heat. 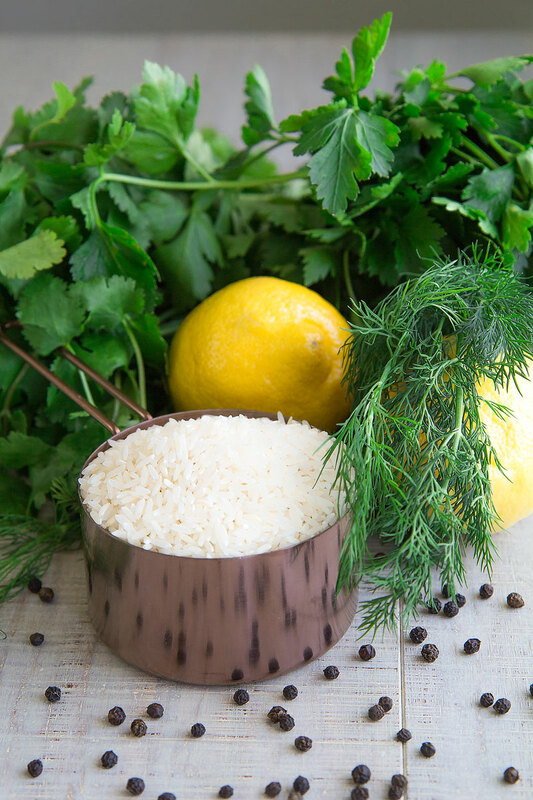 At this point, rinse, dry and mince the herbs, and combine with the rice and onions. Eventually, pour the rice stuffing into a plate and let it reach room temperature. First, bring to boil a pot full of water. Then, place the pot far from the heat and poach immediately the leaves a couple of minutes. Finally, rinse the leaves with cold water. Now, line the bottom of a pot with a layer of grape leaves: these to protect the dolmades. At this point let's prepare the dolmades! Spread out one or two grape leaves, depending on their size. Then, place a tbsp of rice stuffing over the leaf, and roll the dolma folding the borders. Finally, place the dolma into the pot. 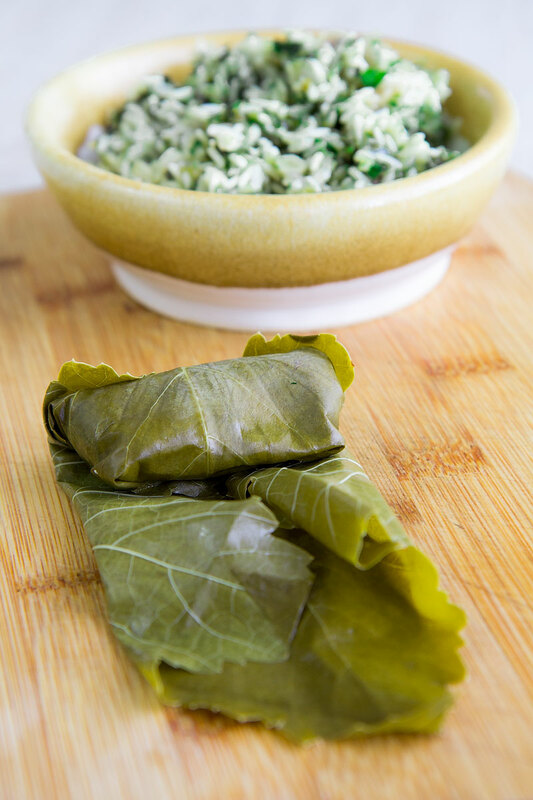 Repeat this step to finish the leaves and stuffing, assembling more layers of dolmades. Now, pour the juice of the lemons, and the rest of the olive oil over dolmades. Then, place a plate over the dolmades. You want the plate to adhere to the rolls, and be a little smaller than the inner of the pot: otherwise, the dolmades will float during the cooking. Finally, submerge the plate and the rolls with water, cover the pot with a lid, and simmer gently about 45 minutes. Monitor the water during the cooking: if it starts to run out, add some more hot water. Once ready, let the dolmades cool down, then serve warm or at room temperature along with tzatziki or your preferred sauces.